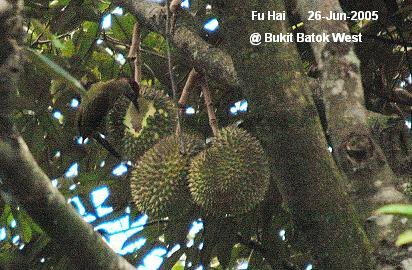 About a year ago or earlier, Goh Si Guim came across a durian tree (Durio zibethinus) at Bukit Batok West with a ripenig fruit whose outer skin had a hole, probably gnawed by a squirrel. There was a Laced Woodpecker (Picus vittatus) around the fruit. Whether it was actually eating the durian flesh or looking for insects was not established. Fuhai Heng managed to capture an image of the damaged fruit with the woodpecker on it (below). 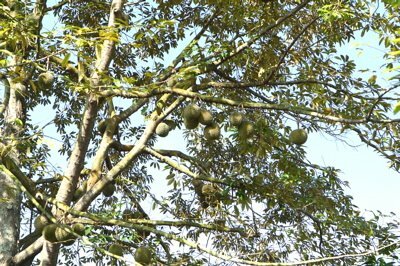 “This evening I passed a durian tree which was laden with fruits. 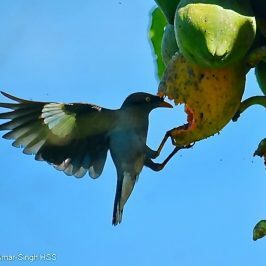 What was unusual was that there were lots of sunbird and flowerpecker activities. “As the durians are getting ripe soon, many plantain squirrels (Callosciurus notatus) (with a black and cream coloured band on the side of its belly) have gnawed through many of them. 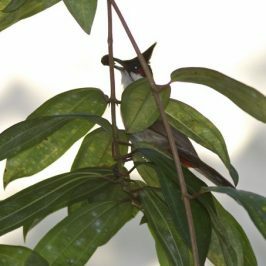 Whenever a squirrel had had enough and moved away, Plain-throated Sunbirds ( Anthreptes malacensis ) quickly appeared and perched on the durian’s thorns and pecked away at the exposed flesh. They were also seen licking the white inner portion of the husk. “Several Orange Bellied Flowerpeckers (Dicaeum trigonostigma) were also busy darting about that tree. On several occasions, they landed on the durians and pecked away. Unfortunately, from my angle, I could not see if they were reaching into any of those bored cavities in the fruits. Johnny Wee later visited the tree and took a picture of the woodpecker that was eating away at a fruit with an opening for about 8 minutes before it flew away satisfied (above). Again, Johnny was not sure whether the bird was eating the fruit or the insects/worms found around it. 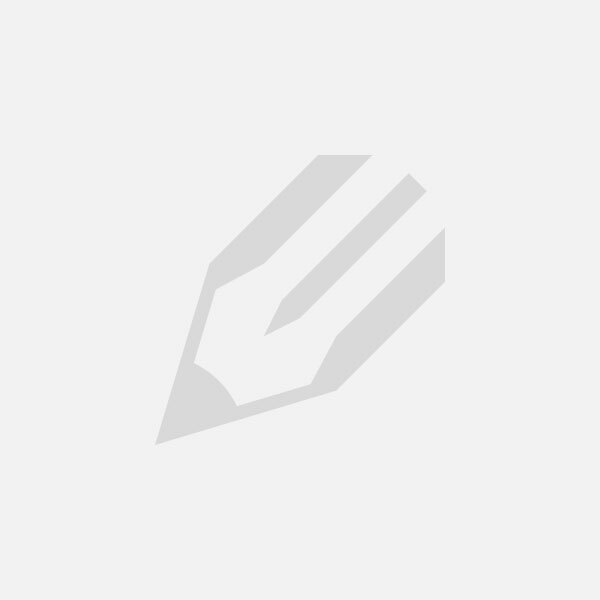 It has been established that woodpeckers are insectivorous as well as fruigivrous. We thank Goh Si Guim and James Heng for their input; Fuhia Heng and Johnny Wee for their images; and R. Subaraj for identifying the squirrel. I’d always thought that durians were best dispersed by large mammals like elephants and orangutans. 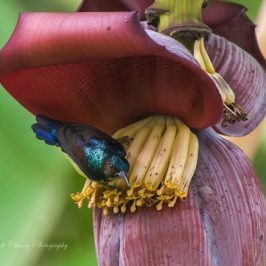 Are there any native animals that serve as efficient dispersers of their seeds? These birds do not help to disperse durain seeds. The seeds are too large for the birds. The birds mentioned here may eat the flesh but they definitely do not disperse the seeds – too large! Squirrels may eat the durian but how efficient a disperser they are I am not able to say. Maybe they just drop the seeds under the tree? Or do they just eat the flesh and leave the seeds behind? Native dispersers? We are the most efficient disperser. Thanks for the info. That was what I had suspected for some time. 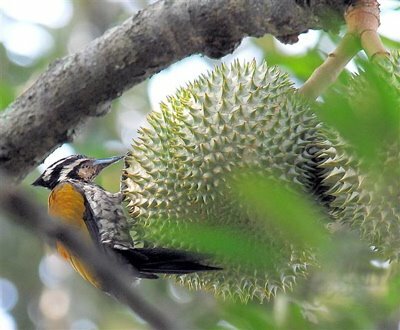 I guess that in the absence of creatures like elephants (I’ve heard they eat durians whole, thorns and all), smaller creatures are able to gain access and feast upon the fruit. Which may not be very good for the tree and its seeds, since I suppose they just fall to the ground or remain inside the fruit as it rots. I’d wondered whether durians evolved thorns in order to repel animals too small to efficiently carry the fruit and disperse the seeds. Seems that the thorns don’t serve that function. I am not sure whether elephants will swallow the durian whole. The skin of the animal may be tough and can withstand the thorns but the inner linings of the mouth and gut are another matter. 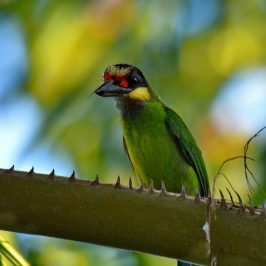 The tough fruit skin and thorns come in useful in preventing animals (except squirrels?) from breaking through when the fruit is unripe. Once the fruit is ripe the parts naturally separate, making it easy for animals to get at the seeds. Only those that swallow help to disperse the seeds (and, like actresses, benefit from a smoother complexion? ).